Hardcourts have traditionally been Djokovic’s happiest hunting ground, suiting his precise footwork best; yet, U.S. Open finals have been more stumbling blocks than showcases for him. He had lost four of the five in which he had played until this time. It appeared to be the set pattern as he won the 1st and lost the 2nd. In Tennis, Chair Umpire is the final authority – generally, we hear them calling ‘ quite please’ … and not much more. It was in 2011 US Open - after losing the first set in the U.S. Open in the final match against Samantha Stosur, Serena Williams hit the best shot of her losing day--a thumping forehand which her opponent barely laid a racket on. Unfortunately for Williams, she also yelled "Come on!" after she struck the ball--a no-no in tennis and a violation of distraction rules in tennis. The Chair Umpire, a woman this time, awarded Samantha Stosur the point, which gave her the game, and reprimanded Williams. "This is not a replay," she said. "This is hindrance and it is her point. Because when you shouted, she ran to the ball and she touched the ball." Williams responded, "Are you the one who screwed me over last time?" Williams wasn't finished and extended her rant to the changeover. At US Open 2015, today, Novak Djokovic has defeated Roger Federer in four sets for his 10th Grand Slam title. The top-ranked Serb beat Federer 6-4, 5-7, 6-4, 6-4 on Sunday night [Monday morning in India] to win three major championships in a year for the second time in his career. He also topped Federer in the Wimbledon final in similar fashion — dropping the second set and taking the next two. The second-seeded Federer is still stuck on 17 Grand Slam championships, with none since 2012 Wimbledon. After a rocky start, the Swiss great raised his level and kept constant pressure on his rival. But Djokovic was just a bit better at the biggest moments, saving 19 of 23 break points — including three in the final game — while converting 6 of 13 of his own opportunities. The start of the match was delayed more than three hours by rain, and when it began the crowd was firmly behind the 34-year-old Federer. But the roars for his opponent didn’t rattle Djokovic much, and he also recovered quickly from a scary fall early in the first set that left him with bloody scrapes on his right forearm, hand and knee. Before the start of the match, history was created with Eva Asderaki-Moore of Greece becoming the first female chair umpire for a U.S. Open men's singles final. The U.S. Tennis Association said Sunday that this year's tournament also is the first major in which a woman chaired both singles finals. Marija Cicak of Croatia handled Saturday's women's final. In the incident referred to above in 2011 US Open Women involving Stosur and Serena, Asderaki-Moore was the chair umpire. Asderaki-Moore is one of 19 Gold Badge umpires working the U.S. Open this year. The Gold Badge is the highest rating a chair umpire can earn, following reviews from tennis' governing bodies. Of the 127 men's singles matches at this year's U.S. Open, 41 of them have been chair umpired by women, according to the USTA. 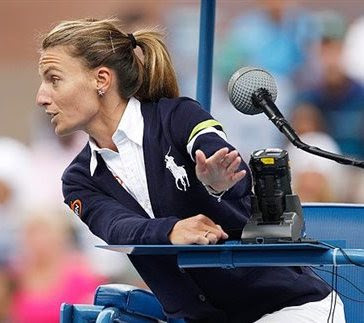 In 2007, Sandra de Jenken of France became the first woman to chair umpire a Grand Slam final for the men at any of the majors, chairing both the Australian and French Opens. At US Open today, up a break early in the set, Djokovic's right foot rolled as he tried to change directions to chase after a volley and slid out from under him. He slammed down hard on his right side, scraping his forearm, hand and knee. Blood was dripping down his arm as Djokovic was broken in the game. He had treatment during the next changeover and started to take control again after that. Today there was rain delay at the U.S. Open — because there's still no roof atop Arthur Ashe Stadium. That's supposed to be in place for next year's tournament. The U.S. Open has a long history of scheduling problems because of weather, including five consecutive men's finals postponed from Sunday to Monday from 2008-12. As part of a broader, $500 million-plus renovation plan for the tournament site, the U.S. Tennis Association has been constructing a retractable roof over Ashe, with 2016 the planned date for its debut. Shrugging off a three-hour rain delay and the overwhelming hostility of the Arthur Ashe Stadium crowd, the 28-year-old world number one captured his second title in New York to add to his 2011 triumph. The defeat shattered 34-year-old Federer's bid to become the oldest US Open champion in 45 years and left him marooned on 17 Grand Slam titles, the last of which came at Wimbledon in 2012. Djokovic's 10 majors takes him level with American Bill Tilden and just one shy of Bjorn Borg and Rod Laver on the all-time list. "I have tremendous respect for Roger and the challenge he presents," said Djokovic, who is now 21-21 in career meetings with Federer. Djokovic at 28 is just seven titles short of 34-year-old Federer – who was his opponent’s age when he won the last of his five US championships here. The chances of adding to his list will slide by the year, his best opportunity since beating Andy Murray at Wimbledon in 2012 being his thrilling five-setter against Djokovic there two years ago. Djokovic needed a set fewer to inflict another defeat at the same place this year.